The mural, located in the pedway near Randolph St. and Michgan Ave., celebrates Chicago's influential creatives. Two DePaul students are also featured in the mural. Underneath Randolph St., only a block away from Michigan Ave. in the Heritage Pedway, DePaul junior Amoz Wright and School of the Art Institute (SAIC) sophomore Sarah Wilson were in the zone. Wilson, sitting high up on a ladder, was painting the face of Chicagoan and photographer René Marban. Sitting on a crate below her, Wright worked on the dark shade of activist Bella Bahhs’ face. The two college artists along with SAIC senior and artist Skyler Sun were creating history in the underground pathways of downtown Chicago. They were painting the first mural in the pedway system. Sun, Wright and Wilson were capturing a sentiment that is strong within Chicago’s artistic scene: the undeniable impression of rising talent within the city and the responsibility that comes with it. The kids have grown up and so have their talents. Because, within the city, there is no better local artist that represents the growing wave of Chicago’s young creatives than Chance. The decision to include him surrounded by ten other rising talents in the mural was a conscious decision. “He is kind of like a face for rising stars. All the people here got the chance of doing the same thing,” Wright said. “They’re all adding something to the city whether it be through their talents, their volunteership or whatever it might be so I thought it would be cool to … have them in the piece. The ten figures in the mural are: singer Kaina Castillo, neckwear designer and entrepreneur of 3dimedesigns Keyante Aytch, visual artist Samantha Jo, visual and sonic content creator Jackie Robertson (Jac Stovler), owner of Nini’s Deli and clothing brand Chicago Native Juan-Elias Riesco, rapper and DePaul biology major Femi Adigun (FEMDOT), streetwear designer of Actually on Dirt and photographer Evan Brown, artist and graphic designer Crystal Zapata, photographer René Marban and poet and activist Bella Bahhs. The color combinations of rose red, bright yellow, navy blue and turquoise splashed in the background brought life to the dullness of the pedway system. And that was the exact intention of Mid-America Asset Management, the leasing company that owns the underground space and that is seeking to bring more traffic into the pedway. In December of 2017, Sun responded to a “Looking for artists” ad from the company in SAIC’s job board; according to Sun, within an hour he was in contact with the owner of the space, checking out the location. Wilson was brought onto the project after Sun realized the amount of work creating a mural would entail. Sun and Wright met for the first time at an SAIC art show only two weeks before Sun was commissioned to build the mural. Each artist dedicated themselves to different areas. Sun focused on the design of the type and background, while Wilson’s interdisciplinary focus on painting at SAIC came into play as she painted all eleven faces. Wright was responsible for sketching the faces and bodies, and Wilson focused on the details within the painting. For all three artists it was their first time working on a mural of this magnitude, each one of them working on each process together. “I wasn’t seeking this at this point in my career. I wanted to do a mural eventually in my city but it wasn’t my goal to do it at this point in my career. So I’m just extremely blessed that God brought me this opportunity,” Wright said. For a couple months, Wright and Sun went back and forth between potential concepts and designs. At first, Wright played with the idea of portraying notable Chicago musicians like Common, Kanye West and Chance the Rapper. He soon decided, however, that the mural’s locations wasn’t the appropriate space for the three musicians to be at. He didn’t think the message would deliver. After a Google search, Wright came across a photo of Chance on Saturday Night Live with his arms spread wide. Having to fill a 40-foot-by-8-foot-tall canvas, he saw potential in the image and decided to go with it. 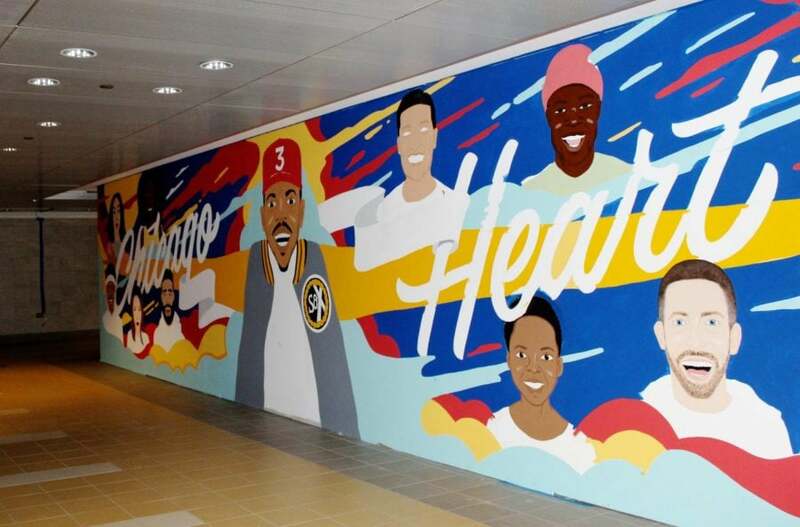 In the finished piece, the phrase “Chicago has my heart” will be sketched across the mural, interwoven perfectly between the strategically placed faces of Chance and the ten other Chicagoans. The artists took inspiration from Kevin Coval, the creator of Chicago Young Authors, an organization dedicated to giving a literary outlet to inner city kids. The last poem in his popular poetry book, “The People’s History of Chicago” is titled, “Chicago has my heart.” Sun and Wright believed the title captured the same sentiment. The “Chicago has my heart” mural will debut on Thursday, May 24, when the public can gather to watch the artists paint the final strokes on the wall.